On its face, fly fishing elitism is silly. It is okay to prefer the fly rod. And it has it advantages. But there is no reason to look down upon conventional tackle. In fact, there are plenty of reasons why a spinning rod should be part of your overall angling arsenal. In this episode, I talk about a few circumstances that might necessitate using conventional gear. Also, I look at how using bobbers, blades, and Banjo Minnows might actually help your fly fishing. Listen to the episode below, or in your favorite podcast app. For the vast majority of salmon, the trip upriver to spawn is a suicide mission. The fish expend nearly every ounce of energy they have fighting currents, leaping up waterfalls, and dodging predators. Their bodies change—they absorb parts of their skeleton and parts of their skull, using the calcium to fuel the trip. Males grow a hook on their lower lip. 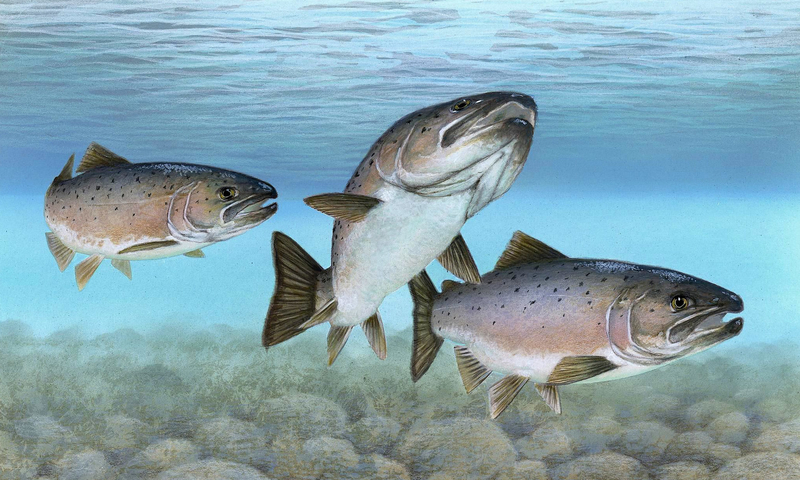 In most cases, after they’ve laid and fertilized their eggs, the salmon die. Occasionally, salmon will survive and go on to spawn again—and again, and again. Killing one species to save another. FISH OR DIE Premiering Sunday! FISH OR DIE is back this weekend! And we could be more stoked to tune in and watch our favorite 4 personalities chase fish all over the globe. Set your DVR’s and tune in live at 10 PM ET/PT on Animal Planet! “For some, fishing is a relaxing solitary experience, but for extreme fishermen and best buddies Chris Owens, Brian Jill, Thad Robison, and Jay Johnson, it’s a passion that drives them to explore some of the most remote and dangerous destinations on the planet in the hopes of finding fish where no one has ever fished before. From glacial streams in Greenland to raging rapids in Borneo, this team of adventurers travel the globe to chase rumors of giant fish in untouched waters. They are not survival experts, but these close friends are determined to work together and boldly follow their dreams to be the very first to fish some of the most uncharted waters left on Earth! FISH OR DIE premieres Sunday, April 21 at 10 PM ET/ PT on Animal Planet. In this largely self-shot series, Animal Planet audiences will trek beside this fearless and dynamic foursome as they journey through remote regions, meeting and befriending locals, and trailing some of the most remarkable, elusive fish in the world. Chris is the king of chaos on all expeditions; he fearlessly rallies the group during their expedition while Brian, a boat captain with nerves of steel, keeps the group on track towards their goal. Thad, the cautious family man of the group aims to make safety their #1 priority, while Jay, the wild-child of the group keeps everyone’s spirits high no matter what comes their way. In the end, these four men are bonded by one idea – the only difference between an obstacle and an adventure is your attitude. Chris Owens, Brian Jay, Thad Robison and Jay Johnson as seen on Fish or Die. In the premiere episode of FISH OR DIE, rumors of giant golden dorado in an uncharted river in the Bolivian jungle lead the team on a grueling expedition to discover if this fisherman’s dream is a reality. With help from a native tribe, the guys push dugout canoes 60-miles upriver towards the foothills of the Andes, where they battle rain and poisonous insects all in their quest for these golden fish. Throughout the season, the team will travel deep into the heart of Zambia, chasing reports of large tigerfish; across Mongolia in search of Hucho taimen, the largest, most ferocious member of the salmon family; and to Greenland in pursuit of massive Arctic char, among other destinations and fish. When thinking about kayaking, fishing and kayak fishing accessories, some of the things that many people overlook are safety accessories. Over the last decade I’ve come to rely on three safety tools that have proven worthwhile in emergent and less than desirable conditions. A knife is one of the most vital tools a kayaker would need on the water or on land to survive some situations. It can help you free yourself from tangled ropes and preparing animals and plants for food or constructing a shelter and campfire. Safety knives come in varying shapes, sizes and prices. Choosing one can be confusing. Which one should I get? Which one’s going to work best? Which one is not too heavy? First off they’re called a safety knife for a reason. They’re for use in safety situations like this one I experienced a few years back. I was testing a new kayak in pretty deep water and it was summer. I wanted to see how easy it was to get back into this kayak if it were to capsize by using a technique often called deep water re-entry. You start by completely flipping the kayak over and while swimming you turn the kayak back upright. This technique should be one of the first safety steps you learn as a kayaker. It gives you the ability to rescue yourself or others in a capsized situation. I had my normal life jacket on with my safety knife attached and I was glad. It was pretty windy that day and as I flipped the kayak on purpose, I went overboard. In doing so a paddle leash wrapped around my leg. Since I had my life jacket on I was able to float near the top of the water but the kayak was separating from me quickly because of the windy weather. As the wind blew the kayak, the paddle leash tightened around my leg cutting off circulation. I was quickly losing the feeling in my leg and knew I had to act fast as I was unable to swim fast enough to catch up to the kayak. I took my knife off of my life jacket cut the paddle leash that had wrapped around my leg and quickly swam for the kayak catching up to it only because I was untethered. This is a key example of a safety or rescue situation where a knife saved me from a pretty serious problem. A safety knife I really like is the NRS CoPilot. I’ve been using this knife for several years and it’s a good one. The one hand assist, textured grip, blunt tip for puncture free use, and multi-edged blade design all make it a great choice, especially for under $50. It sounds like a rather odd question but anytime you are on a small watercraft like a kayak, not only should you be able to see but you should be seen. Power boats, moving quickly across the water need ample warning that you are near. A couple of things to help with that are lights and flags. I have two favorites both make sure you are seen in low light conditions. 1. You can light up your kayak with a kayak lighting like the Yak-Power Complete LED Kayak Light Kit. LED lights provide the right amount of light for both safety and functionality allowing for easy visibility at dusk and dawn. 2. A 360 degree light is needed for night time fishing, so why not combine a light and a flag? A few companies make exactly that. The Railblaza Visibility Kit II offers everything you’ll need. With a rigid, meter long pole, fluorescent flag, bright 360 degree light and mounting port, this battery powered pole will make sure you are seen day or night. You’ve probably heard the old phrase, “It’s not if but when,” and fishing proves this true time and again. It isn’t if you ever get cut or if you ever hang a hook in your leg, it’s correctly thought of as when. Knowing that you’ll eventually shed some blood, are you properly prepared? Most outdoors enthusiasts are not. Having a first aid kit robust enough to handle most situations has more than once saved a day on the water for me. I look for several different things in a first aid kit. Medications are always a good thing to have on hand. Having an antihistamine for allergic reactions, some ibuprofen for swelling, and some aspirin for blood thinning during heart attack events are an excellent spread to cover most situations where medicine can help. Antiseptic wipes, sterile gauze, a variety of adhesive bandages, and some butterfly closures will help deal with most situations that aren’t life threatening involving cuts and blood. Bandages and wraps for aches and sprains are a nice addition. Pair that with some tweezers, split ring pliers for removing hooks from embedded baits, and a good set of snips and you’ll round out a pretty decent kit. If you need a recommendation, check out the Sportsman Series Bighorn Medical Kit. It’s got nearly everything you’ll need. Another first aid kit that can work is the Bass Pro Shops Weekender First Aid Kit. When you’re looking at kayak accessories, don’t skip on a safety accessory that so many people are missing out on. Check out some dive knives is to attach to your life jacket before your next trip. Want to catch more fish? Understanding the map of your lake makes it a lot easier! If you’re using modern electronics there are some amazing tricks that make it even better. Today Tim shows how to highlight depth zones, adjust lake levels, and select prime fishing locations. If you’re using a traditional paper lake map this information still applies. Spend less time searching and more time catching with these quick adjustments! Tim begins by showing the difference between base map software and aftermarket mapping chips. He goes on to assume you’re using some version of a map card in order to get accurate contour lines. Tim uses his Humminbird Solix to show a variety of structures and how they appear on the map then goes on to teach the subtle differences that will save you a ton of searching and fishing time! If you want to become a more efficient angler you need to get comfortable reading a map of your lake. You don’t need an expensive unit and software to be a great angler, you can get by with a simple paper map, but good electronics make it much, much easier. Below is a breakdown of the unit and cards Tim was using in the video as well as a few other options he recommends at various price points. Keeping your electronics screen clean is really important. The best product we’ve found to do that is Wave Away. It cleans finger prints and water spots with very little effort instead of scrubbing at the screen until your hands hurt.